Why Does The Legend Of The Mustang Wagon Keep us So Interested?? Koscs goes into a little more detail than we did, so we see his article as only adding to the lore and fascination of the Mustang Wagon. One can wonder, "Did Ford blow it when they ignored that possibility of producing a true Mustang vehicle in the traditional station wagon configuration?" We'll never know. But understand this, some of us at Garagistry are eagerly awaiting the production of a true station wagon once again - far too many memories are associated with the real American Family Car. Ford was having no trouble selling Mustang coupes, convertibles, and fastbacks when the brawnier, restyled 1967 models hit dealerships in the fall of 1966. Nevertheless, Ford designers were still tinkering with the basic concept of what a Mustang could be. In October of that year, executives evaluated a finished fiberglass model of…a wagon. Ford had previously reviewed and rejected potential four-door Mustang variants. The wagon concept was a two-door in the manner of the 1955–57 Chevrolet Nomad. Some might refer to the body style as a sport wagon or the “shooting brake” label derived from British hunting-car history. But Ford was not alone, and possibly not first, when considering a more practical Mustang. 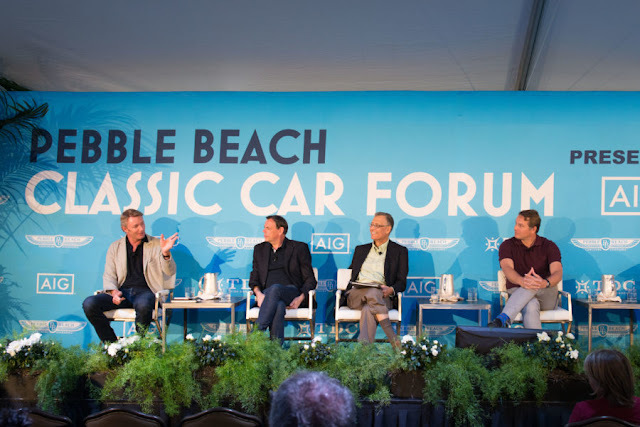 Robert Cumberford, an independent designer who had worked for GM in the 1950s, hatched an idea for a Mustang wagon in cahoots with Barney Clark, an executive at Ford’s ad agency (J. Walter Thompson), and Jim Licata, a car enthusiast friend. As Cumberford recalls, the main reason behind the wagon conversion was improved handling, but additional luggage space was a welcome bonus. The design process began with Cumberford sketching some changes to a profile drawing of a Mustang coupe. The drawings, along with a 1965 Mustang that Cumberford, Clark, and Licata purchased, were sent to Construzione Automobili Intermeccanica in Italy in spring 1965 for the conversion. The white Mustang was an early-build model with a 260-cubic-inch V-8 and an automatic transmission. Including the car, shipping, and conversion costs, the project totaled less than $10,000. Cumberford, known by many today as the auto design critic for Automobile, was at the time working with Intermeccanica on the Ford-powered Griffith 600, a sports car that ultimately became the stunningly beautiful Italia. Founded by Frank Reisner, the coach-builder had made bodies for the Buick-powered Apollo GT in the 1960's and later the Italia and its successor, the Indra. Since 1980, Intermeccanica International, headed by Reisner’s son, Henry, and now located in Vancouver, British Columbia, has been building Porsche 356 replicas. The Cumberford Mustang wagon was originally white, but he asked Construzione Automobili Intermeccanica to give it a red paint job. The plan for the Mustang wagon was to show the car to Ford in hopes that the carmaker would sanction a limited run, built with conversion kits shipped from Intermeccanica. In Italy, Intermeccanica’s craftsmen fabricated a new rear roof section, a tailgate, folding rear seat, and cargo floor. Following Cumberford’s design, the rear side glass elegantly traced the Mustang’s fender contour. The tailgate was hinged at the bottom, and the power-operated window glass lowered into it. The Mustang’s rear fuel filler was moved to the left fender, and the distinctive tri-bar taillights were cut so that the outer third remained in place when the tailgate was lowered. The build was no less thorough inside, where Cumberford specified a fold-down rear setback to expand cargo capacity in a carpeted space. “It looked like a Ford-made product, not a custom-built car, which was the idea,” Cumberford says. In 1966, Clark showed the Mustang wagon to Ford after having it repainted green over Intermeccanica’s red hue. Cosmetic features from the Mustang’s GT package spiffed it up, and Koni shocks and Pirelli radials aided handling. When Ford showed no interest in the freelance-designed Mustang wagon, Cumberford and Reisner drove it to the former Studebaker plant in South Bend, Indiana, which was busy building the Av anti II continuation model, and then on to Holman and Moody, Ford’s racing contractor in North Carolina, to gauge interest in building the car. Neither was keen on the project. “They could have assembled kits from Italy if we could have funded them,” Cumberford says. Was there a copycat? A California-based company was advertising a somewhat crude-looking fiberglass hardtop roof called the Hobo that turned a Mustang convertible into a quasi-wagon. Installing the $595 accessory roof required removing the trunk lid and convertible top. Unfortunately for Cumberford, Clark, and Licata, it was one of a kind. Remember, Preserving Automotive History...One Car At a Time® is not just a slogan. It's what we do. For more details, click here.